Foxconn Technology Group – manufacturer of the iPhones – has disclosed the company’s three-step plan in automating its factories in China. Dai Jia-peng, general manager for Foxconn’s Automation Technology Development Committee, told the DigiTimes that the first phase of the company’s automation plan involves putting automated work stations in places where workers are not willing to work and in areas where it is dangerous for humans to work. The second phase of the company’s automation plan involves the automation of the entire production lines, while the third phase involves the automation of all Foxconn factories with only a minimal number of workers in-charge of logistics, testing and inspection processes, Dai said. Dai added that Foxconn’s factories in Chengdu in western China; Shenzhen in southern China; and Zhengzhou in northern China are already in the second and third phase. For its automation project, Foxconn has deployed over 40,000 Foxbots – the industrial robots built by Foxconn – to different factories in China, this according to Dai. The general manager for Foxconn’s Automation Technology Development Committee stressed that robotic technology will not totally replace human workers as humans have the ability to quickly switch from one task to another. 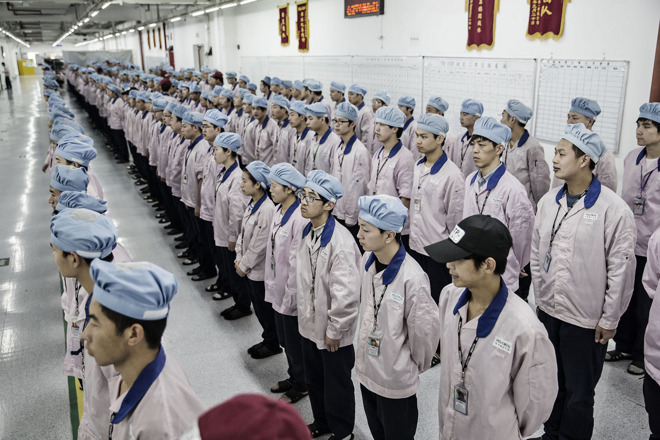 In May 2016, a government official in China told the South China Morning Post that one Foxconn factory in China replaced its 60,000 human workers with robots.